Flying with Flaps — Understanding their use. Sooner or later, many RC modelers try their hand at a scale subject, and since most full-size aircraft use flaps, their scale model should include them as well. A scale model with the flaps fully deployed is an impressive sight. This will most likely be the pilot’s first exposure to flaps since most of our sport models don’t use them. Flaps are terrific; they can transform that hot P-51 from a bear to a pussycat on landing. They can, on the other hand, present problems if misused. 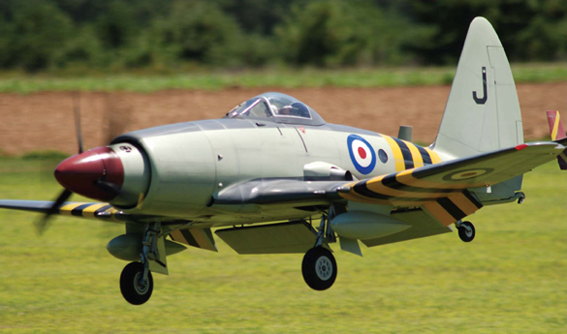 This impressive Westland Wyvern is the work of David Wigley. The model weighs 50 pounds and features scale Fowler flaps, which increase both drag and wing area when deployed. Next time you fly in a large commercial airliner, take note of the transformation of the wing prior to takeoff and landing. Airliners or other fast aircraft achieve their eye-popping performance through the use of small, thin wings. The problem with this type of wing is that they stall at high speeds and consequently the takeoff and landing speeds are also very high. When flaps are lowered they change the wing’s lift and drag characteristics and lower the stall speed. By changing the camber of the wing, the lift and drag are increased for a given airspeed. As a result of these changes the aircraft can land at a slower airspeed, fly a steeper landing approach and use more power on landing, which is a good thing if you have to go-around with your model. The BH Models Trojan slows to a crawl with flaps deployed. There are four basic types of flaps: plain, split, Fowler and slotted. The plain flap is simply a hinged portion of the trailing edge. Split type flaps are hinged at the bottom of the wing and create much more drag than plain flaps. The slotted flap is similar to a plain flap, but has a slot between the wing’s trailing edge and the flap. The air passing through the slot delays the airflow separation and creates a greater increase in lift with a smaller increase in drag than a plain or split flap. Fowler flaps extend aft and down increasing the wings area and provide large increases in lift with a minimum of drag. Fowler flaps move rearward and downward increasing the wing area and curvature. Plain flaps lower the wing’s trailing edge increasing its curvature and, therefore, its lift. Slotted flaps allow high-energy air to flow from underneath the wing up and over the flap to help prevent airflow separation. Split flaps generate a lot of drag by disturbing the airflow on the underside of the wing. Deflecting flaps will cause a twisting action to the airplanes’ wing. The type of flap as well as the wing’s design will determine the amount of twisting action, with the split flap generating the least amount. Deploying the flaps may result in the plane pitching up or pitching down. The elevator must be used to compensate and keep the plane on the desired approach path. Another characteristic of flaps is that the first half of the flap’s deflection results in a greater increase in lift while the second half results in a greater increase in drag. Flaps also impart a large structural load on the plane and should only be used at a lower airspeed. Full-size planes have their air speed indicators marked for safe flap operating range. 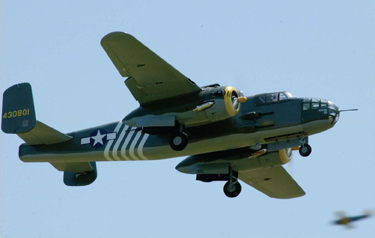 The Top Flite B-25 Mitchell bomber has inboard and outboard flaps and lands like a trainer. 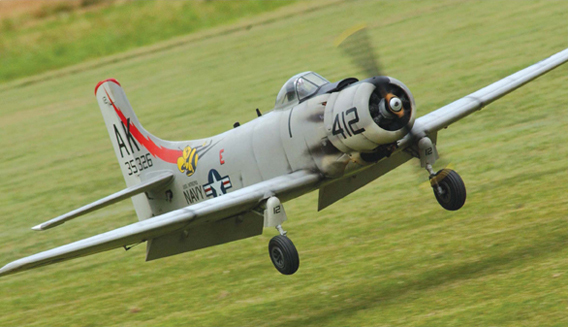 Nick Ziroli greases another landing with the help of the effective flaps on his Skyraider. Since every aircraft reacts differently to flaps, it’s important to learn how yours reacts before committing to landing. The safest way is to do a no-flap takeoff and fly your model around to get comfortable with it. At a safe height, reduce the throttle to about 1/3 and let the plane slow down. Next, add 1/4 flaps and see what your plane does. If it balloons (pitches nose-up), apply some down-elevator to help maintain the airspeed. Once the plane is under control again, add full flaps and be prepared to adjust the elevator pressure on the stick. You may be surprised how much elevator it takes to compensate for full flap deflection and how much the plane will slow down. With today’s radio systems, it’s easy to program a mix for the proper amount of elevator trim when the flaps are dropped. This will greatly ease the pilot’s workload. Once you are comfortable with flying the plane with the flaps down, it’s time for the landing. If you have your flaps set up to drop in increments, such as a dial or slider switch, add about 10 degrees on downwind after the plane passes your position and then add about 20 to 25 degrees on base leg. After turning, add full flaps and use power to adjust the flight path. Remember, you will need more power with flaps and the approach descent rate will be steeper. With a little practice, you will be rewarded with picture-perfect landings. Flying a scale model with operational flaps is a very rewarding experience. Not only do they look neat, but they also provide the same benefits as the full-size version. 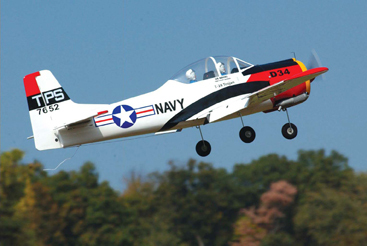 They take the anxiety out of landing your lead-sled WW II fighter or similar high-performance aircraft and provide a safer and more enjoyable RC experience. Flaps impart a tremendous load on the wing and require attention during their installation. Make sure you use enough heavy-duty hinges on each flap and a heavy-duty control horn. There are many ways to actuate the flaps, including torque tubes and bell cranks. For large, fast or heavily-loaded models, the best way is to use a servo for each flap. These planes will also benefit from the flaps being locked in the down position preventing the airstream from blowing the flap back to the up position. This basically means that the servo arm is directly in line with the flap horn at full deflection and this takes the strain away from the servo. This is accomplished by turning on the radio and selecting full down flaps and choosing a servo horn position that is in line with the horn. Now, retract the flaps and make up the linkage from the servo to the horn. The amount of flap deflection is determined by the length of the servo arm; for more flap deflection, place the linkage farther out on the arm. The use of ball links may be required for smooth action and to eliminate binding. Adjust the power to maintain the approach path. Flaps add drag and require more power. Add power on a go-around and begin a climbout before retracting flaps. Deploy flaps at high speed. The flaps may depart the wings or cause serious structural or servo damage. Flaps also increase the washout in the wing since the angle of attack of the “flapped” section is greater than that of the outboard aileron section of the wing. This induces stability as the flap section will stall first while allowing the ailerons – which are still “flying” with less angle of attack – to maintain lateral control.